EFFORTS by the Association of Mineworkers & Construction Union (AMCU) to hike the pressure on Sibanye-Stillwater through a seven-day campaign of secondary strikes suffered an setback over the weekend after it was advised by its lawyers to retract strike notices at a number of companies including DRDGold and African Rainbow Minerals (ARM). AMCU called secondary strikes at about 15 companies where it is recognised including AngloGold Ashanti, Harmony Gold, and operations owned by Anglo American Platinum (Amplats) on February 21 in order to press home demands for an improved gold industry three-year wage deal from Sibanye-Stillwater to which other unions agreed last year. According to a letter issued by AMCU to DRDGold, seen by Miningmx, the union stated: “Please note that the Association of Mineworkers & Construction Union has taken legal counsel and decided to hereby withdraw our notice of secondary strike action at your operations”. It didn’t provide any other details. In terms of section 66 of the Labour Relations Act, unions are entitled to call secondary strikes where it assists them in a primary wage dispute provided there is a financial link between the company targeted in the secondary strike with the company involved in the primary dispute. It is all the more unusual, therefore, that AMCU has decided to withdraw its action against DRDGold since Sibanye-Stillwater has a 38% stake in DRDGold following a share for assets swap last year. No notices of secondary strike withdrawal have so far been issued to other companies, Miningmx understands. 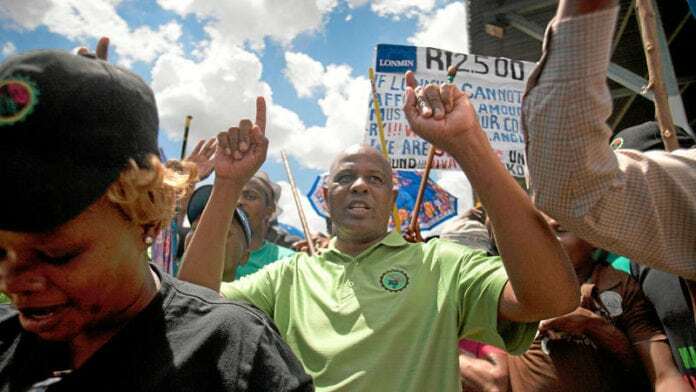 In any event, AMCU president, Joseph Mathunjwa, has a fight on its hands regarding the strike at Sibanye-Stillwater’s Driefonten and Beatrix gold mines, which was first called on November 22. Speaking during the company’s 2018 financial results review on February 20, Sibanye-Stillwater CEO, Neal Froneman, said the firm had prepared for an extended strike. “We can survive the strike for much longer than seven days as we can pull other levers. AMCU must be very desperate to take the industry out on strike which can’t be legal,” he said. Froneman added, however, that a war of attrition was “… not the smart thing to do” and said that his company was willing to compromise with AMCU provided it didn’t upend the terms of wage deals the company had signed with other unions such as Solidarity and the National Union of Mineworkers (NUM) regarding gold mine wages. “Personally, I don’t think the strike will continue for long,” he said. But Froneman warned the effects of the strike at the gold facilities could have broader consequences. For instance, it might impact Sibanye-Stillwater’s ability to integrate Lonmin, a company for which it has successfully bid, as well as the character of platinum sector wage talks which are about to begin in a few months. CEO of the Minerals Council South Africa, Roger Baxter, described AMCU’s campaign as “unfathomable” given the parlous state in which the gold and platinum sector were in last year: 71% of gold mines were marginal or loss-making whilst 50% of platinum mines were deemed to be “unsustainable”, the council said. “The companies are considering the notices and will do everything in their power to avert such a strike, including legal recourse,” Baxter said in a statement. That is a lie. All the big platinum companies reported profits in 2018. PGM prices are good right now. No not really. There is a big difference between operational profit (taking into account only operational costs) and total profit ( which takes into account AISC-All In Sustaining Costs). When rhodium was at 700$ and palladium at 800$ it was possible that 50% of pgm mines were loss making. But with rhodium at 2500 and palladium at 1500$and with weak Rand only a small numer of mines possibly 5% are loss making. Titles of the recent articles confirm that PGM miners are doing fine and even reopen mouthballed mines.